It is fit for railway maintenance, mining and construction as well as for other heavy load holding requirements. - Min. Length: 510 mm. - Max Length: 710 mm. Top links and hydraulic adjustable lift links for all type and series of agricultural tractors, included special tractors for wineyard and orchard. We are engaged in manufacturing and supplying a wide range of Props & Jacks. These Props & Jacks are manufactured by using top quality of raw materials and designed according to the international standards. These are quality proven to ensure efficient in performance, reliability and easy installation. We supply Hydraulic Jack for Truck, Car, Bus etc.We are engaged in manufacturing an extensive array of Long Loader for Hydraulic Jacks, using superior grade raw material and advanced technology. These manually operated loaders are available in several variants as demanded by our esteemed clients. These loaders are widely utilized in various industrial applications. Feature: Corrosion proofSuperior strengthFree from flaws. 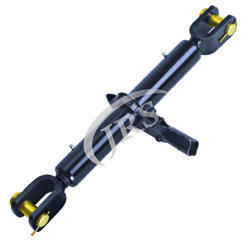 We are offering wide range of high pressure jacks. These jacks utilized in construction sites, mills, railway workshops and power plants for industrial maintenance. Heavy duty Ratchet Jacks with grease zerks for lubrication, Clevis pins, clip pins and handle included. Available in primer or powder coated version in different colors.